ITIL stands for “Information Technology Infrastructure Library®” and being adopted by millions of professionals worldwide is recognized to be the most relevant Service Management Framework at global level. The ITIL 4 certification scheme gives comprehensive, practical and proven guidance for establishing a service management system, while also providing a common glossary of terms for businesses using IT enabled services. ITIL or Information Technology Infrastructure Library®, is the IT Service Management framework widely recognized to be the most enabled IT best practice which provides a common language and tools that power collaboration within IT teams, to deliver value across the business. The ITIL 4 certification scheme has been given comprehensive, practical and proven guidance for establishing a service management system for over 25 years. The update from ITIL v3 to ITIL 4 started in 2018 when AXELOS engaged a diverse range of people in the development of ITIL 4 assembling a Global ITIL Development Group, which is made up of over 2,000 professionals. The outcome of this collaboration is a smooth transition towards a flexible and agile guidance. The digital transformation and the unavoidable interaction between humans, digital technologies and physical assets has led to an increasingly fast-paced and complex environment, requiring organizations to be more agile, better equipped to adapt what they do, and ready to adopt new ways of working to succeed. 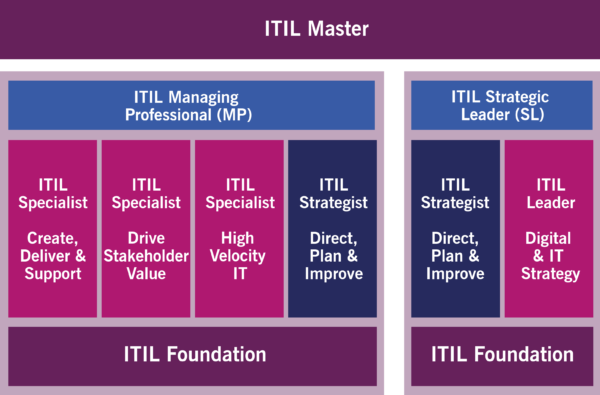 This evolution of the ITIL 4, through its framework, helps organizations to connect and align the different challenges that are relevant not only to ITSM professionals, but also by a wider range of professionals working in the digital world. ITIL 4 expands on previous versions by providing a practical and flexible basis to support organizations on their journey to the new world of digital transformation. It provides an end-to-end IT/digital operating model for the delivery and operation of tech-enabled products and services and enables IT teams to continue to play a crucial role in wider business strategy. The ITIL 4 Certification Scheme provides a comprehensive, practical and proven guidance for establishing a service management system, providing a common glossary of terms for businesses using IT enabled services. The New ITIL 4 Certification Scheme is composed by two streams: ITIL Managing Professional (ITIL MP) and ITIL Strategic Leader (ITIL SL). Each stream has been developed to provide IT specialists with an in-depth knowledge of the key areas of service management and IT strategy to support their knowledge and professional growth. To obtain the designation ITIL Managing Professional (ITIL MP) or ITIL Strategic Leader (ITIL SL), the professional must complete all modules in each stream, with ITIL Strategist being universal module for both streams. As for the ITIL v3 Certification Scheme, candidates have to pass the ITIL Foundation module to have access to the further modules. In ITIL 4 candidates can choose between two streams, ITIL Managing Professional and ITIL Strategic Leader, but the achievement of the ITIL 4 Foundation Level is a requirement of both streams. Any doubts? Get in touch with us by filling in the form! Continuing your ITIL certification scheme gives you the chance to gain the 17 credits necessary to the transition from the ITIL v3 to the ITIL 4 certification scheme. For the ITIL v3 formation and certification QRP organizes in-house courses in all the Belgian territory available in French, English and Dutch. Interested in the ITIL v3 Foundation certification? Contact us by filling in the form at the bottom of the page! Do you need further information about ITIL certification? Do you have any doubts about ITIL certification V3 or V4? Contact us by filling in the form.